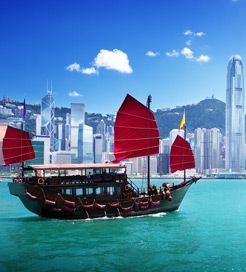 There are 2 ferry routes operating between China and Hong Kong offering you combined total of 19 sailings per day. TurboJet operates 1 route, Shenzhen (Shekou) to Hong Kong Airport (Skypier) which runs 14 times daily. Sea's Young operates 1 route, Humen to Hong Kong Airport (Skypier) which runs 5 times daily. As the frequency and duration of crossings on some routes varies we would advise that you do a live search for crossings from China to Hong Kong to get the most up to date information. China is the world’s most populous country situated in East Asia, with an enormous eastern coastline facing the Yellow, East China and South China Seas. 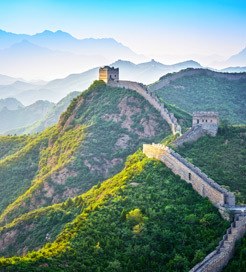 As one of the most visited countries in the world, China has absolutely everything you need for a fantastic holiday. The largest city, Shanghai, with its innovative skyline, adds a splash of modernity to a nation rich in history, whilst the world-renowned cuisine can be enjoyed in every corner of the land. Aside from the abundance of fascinating temples and ancient cities, China boasts a beautiful and diverse natural landscape comprising huge valleys, sandy beaches and spectacular rice fields. It is also the third most biodiverse country in the world, with almost thirty-five thousand animal and plant species found so far. China has a number of well-developed ports in many cities offering frequent, high-speed crossings to popular tourist destinations in East Asia, including routes to Japan from Shanghai.